Black Friday 2017 is upon us! Some of you probably already conquered the box stores and are taking a well-earned post shopping nap, but for those still looking for some deals, here’s a quick roundup of Wccftech’s Black Friday 2017 gaming posts. Catch up on all the deals from Sony and Microsoft, big stores like GameStop, and online retailers like Amazon. Happy bargain hunting! As in the past, Sony is offering a variety of hardware deals that should be available across almost all retailers. Go to the store of your choice and you should be able to find a 1 TB PlayStation 4 for $199.99 or a PlayStation VR Gran Turismo Sport Bundle at $299.99. Check out Wccf’s full rundown of Sony’s Black Friday hardware deals here. Of course, the PlayStation Store is also offering discounts on digital software. These include Assassin’s Creed Origins for $41.99, Uncharted: The Lost Legacy for $19.99, and Horizon Zero Dawn for $19.99. As always, PS Plus subscribers get an additional 10 percent off these sale prices. Check out all the PlayStation Store discounts here. The Microsoft store is offering a wide variety of great deals, too. These include Dead Rising 4 for $20, and Halo 5: Guardians for only $30. Xbox Live Gold members get an additional discount on these prices. Check out Wccf’s rundown of the best Microsoft Store Black Friday deals here. Nintendo isn’t really offering any special hardware deals this year (it’s waaay too early to be marking down the Switch), but the eShop is offering a few software deals. These include 1-2-Switch for $39.99 and Super Bomberman R for $39.99. Check out all the Nintendo eShop Black Friday deals here. Target is offering a good mix of hardware and software deals, including a 500 GB Xbox One S with a $25 gift card for $189.99, Resident Evil 7 for $15, and Call of Duty: WWII for $45. Check out Wccf’s rundown of the best Target Black Friday gaming deals here. Best Buy is serving up a 500 GB Xbox One S bundles for $229.99, and sweetening the deal by throwing in an extra controller. They’re also offering games like Ghost Recon Wildlands for only $20. Check out Wccf’s rundown of some of the top Best Buy Black Friday gaming deals here. GameStop is really trying to undercut the competition, by offering the best deals of any brick-and-mortar retailer this Black Friday. These include a 1 TB PlayStation 4 Pro for $349.99, Wolfenstein II: The New Colossus for $25, and Destiny 2 for $27. 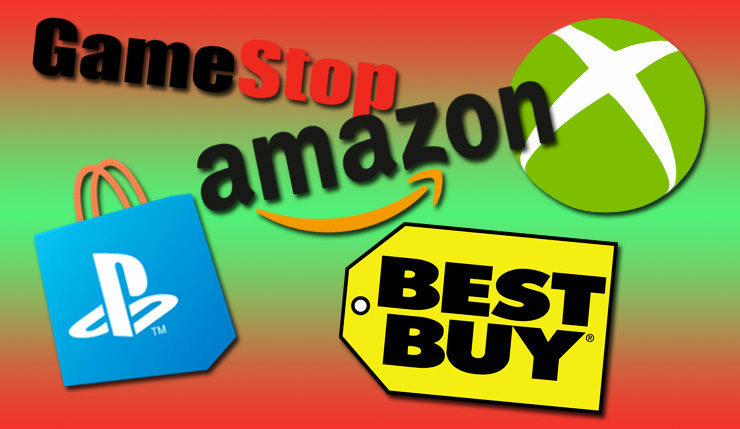 Check out Wccf’s rundown of the best GameStop Black Friday gaming deals here. But maybe you don’t want to brave the cold and crowds? Maybe you just want to fix yourself a leftover turkey sandwich and grab some deals from the comfort of your couch? Thankfully, Amazon is matching almost all deals being offered by their competitors, and, in some cases, one-upping them. For instance, they’re offering a 1 TB PlayStation 4 Pro with Destiny 2 for only $349.99, Final Fantasy XV for $17.99, and Middle-earth: Shadow of War for $25. Keep up with all of Amazon’s rotating Black Friday gaming deals here. Did you accidentally sleep in? Don’t worry, you haven’t missed all the fun. Almost all these deals will be available until at least November 28 (next Tuesday). Any particular bargains you have your eye on or want to share? Call ‘em out, below.